Finally finished the entire unit of Norman Cavalry. I had one base done a while ago, but ended up realizing that putting the cavalry on the same size base as the infantry made the cavalry units too bunched up looking, and also made it impossible in many cases to put them into base contact to their front or rear, which is obviously not idea. So I rebased the one stand that I did and the three new stands that I just finished on double depth bases. What I did was take two of the precut bases I use for the infantry (3 inches wide by 1 inch deep roughly) and glued them together to make one base that is double depth. 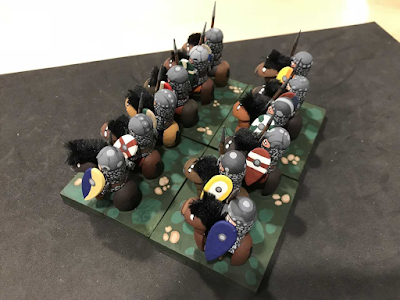 There are four stands of three figures each in a 2 x 2 stand formation. 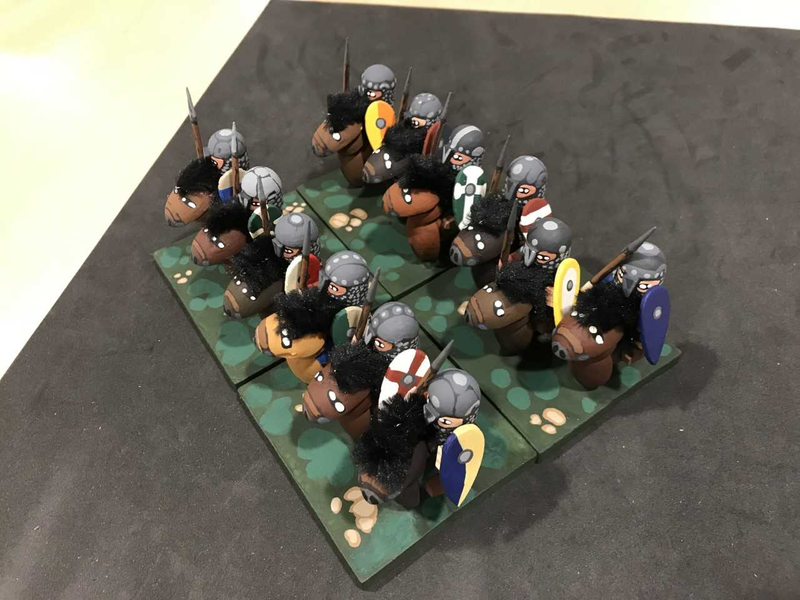 I kept the spear position the same for all the figures (it's a lot easier that way even if not very realistic) but tried to make it so that they were not in perfect lines. I also turned the horses heads in some cases from side to side just to break it up a bit. I think they look particularly good from the front. Here they are from the "shield side." Nothing at all new construction or paint wise except that I used hot glue to glue the horses to the base. Even after sanding the horses "hooves" piece (the split egg) a little flat so that you get more surface contact between the base and the horse, with the white glue alone it's just a little "wobbly" sometimes. 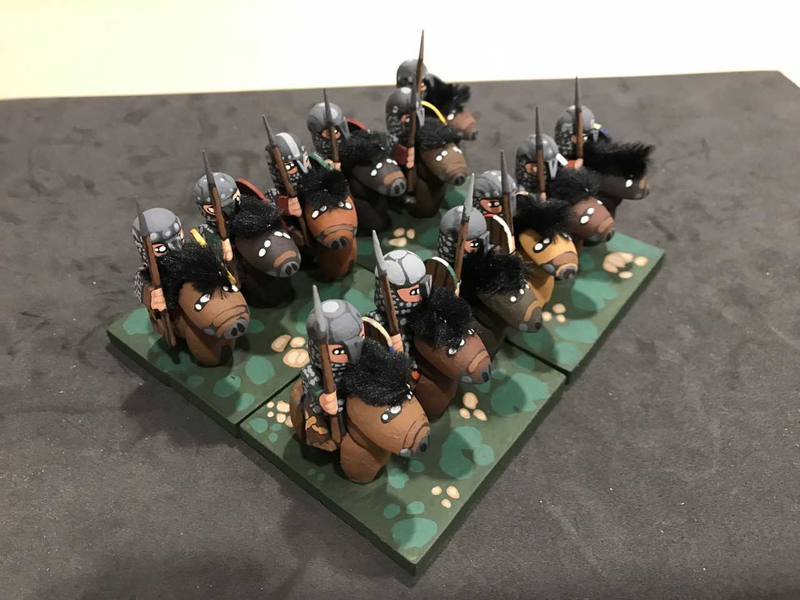 Being liberal with the hot glue does make quite a strong bond, and if there is extra glue sticking up on the horses legs I just painted it green so that it looks like grass. No one is looking at the horses feet when they look at these figures anyway, let's be honest. No reason losing any sleep over the place where the hooves come into contact with the base! I'm most of the way through the build of the next unit, which is a Saxon Housecarls unit. I've got swords, axes, and spears in that one with a little more variety in terms of arm and weapon position. I'll also use a mixture of round and kite shields, so they should look pretty cool, at least I hope so. They look fantastic,what a unit! Thanks Alan, they are a pain in the neck to paint when they are already glued onto the bases (which is the way I do them), but when I get finished with a stand of them, I'm always pleased. What made them a pain to paint? They look great! Thanks! They are only hard to paint because I glue them to the bases first. It can be hard to get a brush into some of the tighter spots where the figures are close to each other. 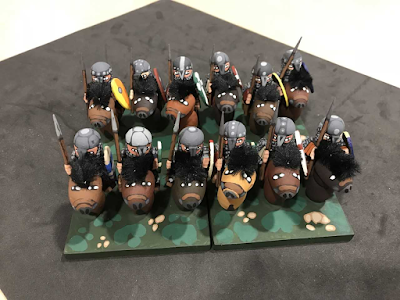 It's actually more of an issue with the infantry figures given there are 4 of them on a base, but for some reason, perhaps because the horses are "rounder" in shape, I feel that I have less brush control when painting the cavalry than the infantry. But I still think the best way to go is to glue them down first.